Do you know the difference between a Reverse Channel Letter sign and a Push Thru sign? And what is the name for those big signs at the entrances to shopping centers? If you’re curious about signs, discover the many types of signs we can create for your business. At BSC Signs we help you discover the ideal type of sign for your business. There’s a specialized type of sign for nearly every situation, and our sign professionals can quickly narrow down the choices and present you with the best options. When customers come to us for help with their signage, they discover that there are beautiful sign designs that they weren’t aware of. Some types of signs are quite new to the industry, and rely on computer-aided precision fabrication. So we thought you might like to take a quick visual tour of the many types of signs we make for our customers. We hope it will provide some ideas and inspiration! Let’s start with Electric signs. They’re a broad category of signs that includes neon, channel letter signs, LED signs and lighted sign cabinets. An electric sign can use fluorescent tubes, neon, or LEDs as the light source. Want your customers to find you during evening hours? Try an electric sign. LED signs are a type of electric sign that employ Light Emitting Diodes (LEDs) as the light source. LEDs deliver impressive benefits to our customers. LED refers to the means of illuminating the sign from the inside, so the term LED sign covers a variety of signs that use that method of lighting. These are not to be confused with the small LED text message boards that are often placed in the front windows of businesses. In the past, electric signs would use power hungry incandescent bulbs that had to be replaced regularly. Fluorescent tubes were an improvement, but now with LEDs you can expect your sign to run for years with minimal maintenance. And they use far less power. Bonus! Channel Letter signs are visually impressive and look great day or night. A channel letter sign is made up of individually constructed 3D letters. Each letter is crafted from aluminum and is internally lit with high-efficiency LEDs. With regular Channel Letter signs, the front of each letter is brightly illuminated. We also make Reverse Channel Letter signs, which have the face of each letter capped and the light directed to the back. The light spills out onto the rear panel or wall, and from a distance it appears to wrap around each letter, creating an attractive glow. For more details and photos of Channel Letter signs, please see our recent blog post. Neon signs are bright and bold and give a classic look that just can’t be duplicated with any other style of sign. They’re used both inside and out for signs both large and small, and can be a signature marketing element for a business. We create a variety of neon signs in styles that serve different purposes, from small interior neon signs, to spectacular exterior displays. The glass tubes of a neon sign contain gases that glow when electricity is applied.That’s what produces neon’s beautiful colors. Neon sign fabricators artfully bend the glass into letters and words. The neon tubes are part of an overall sign design that complements their effect. There’s nothing quite like the friendly glow from a neon sign at night! The Push Thru sign is a beautiful design, but its construction is hard to visualize. It helps to think back to when you were a child. Do you remember the game where you pushed blocks through holes? It’s a bit like that. The Push Thru sign starts as a metal panel, made out of wood or metal. Letter-shaped holes are cut into the panel where each letter will be placed. Then the matching 3D letters are precision routed from clear Plexiglas®. The letters neatly fit inside their matching holes. When the sign is assembled, the letters are pushed through their matching holes and firmly secured. Then the illumination is added. Small LED lights are placed at the base of each letter, just out of sight. Their light is carried out through the Plexiglas® letters, which makes them glow. Like a neon sign, you need to see a Push Thru sign in person to appreciate the effect! An Electronic Message Center is a type of digital sign that allows you to present a single message, or a series of messages. They can display a combination of text and graphics, and are available in monochrome or full color. They’re sometimes called LED Message Displays. They are available in many sizes and capabilities, and are often part of a larger monument sign. Full-service sign companies don’t manufacture the EMC LED panels themselves. They are custom ordered from one of the large EMC makers, such as Daktronics of South Dakota. The sign company usually incorporates the EMC panel into a larger sign that suits the business, school, or organization. Site signs are temporary signs that need to look good, deliver a message, and be economical. 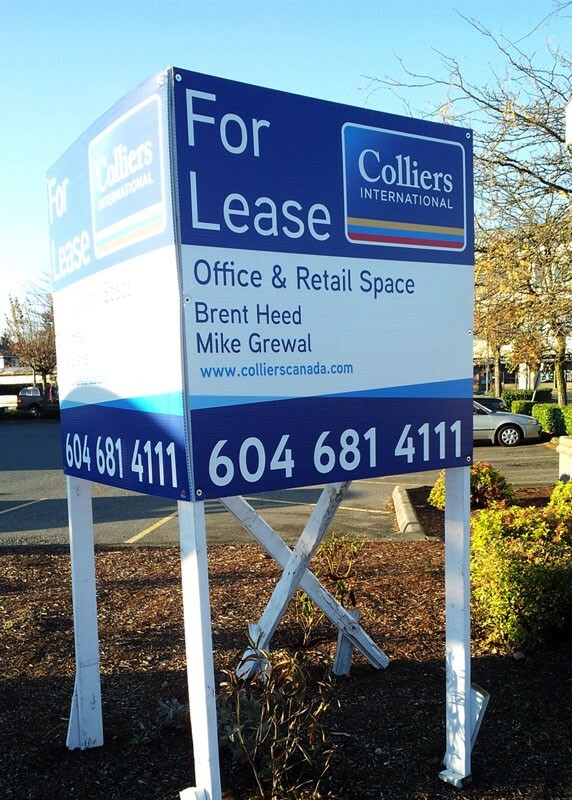 You know those great big FOR LEASE signs you see at shopping plazas? Those are site signs. So are the signs around construction sites that tell you about the building contractor, or are used to promote a new condo development. Site signs can be made of many materials including plywood, aluminum, or plastic composites. If you’re looking for a large and effective electric sign on a limited budget, then a Lighted Sign Cabinet is a good choice. They’re very popular in shopping plazas, where businesses change from time to time. In fact, if your retail store is located in a plaza, it may be your only choice for your main sign. This type of electric sign can be mounted on the front of a building, or placed on a pole or pylon. The cabinet is a painted metal frame, which is basically a big box with internal wiring, power supply, and a light source. Cabinet signs traditionally use fluorescent lighting, but we also use LEDs as the light source. The front of the sign has a translucent white acrylic sheet, and the sign’s letters and shapes are precision cut from adhesive-backed vinyl. In this photo, you can see a sign cabinet that has had the front panel removed, revealing the fluorescent tubes. A blade sign extends out at right angles to a building and gives good visibility to pedestrians and traffic passing in both directions. They’re particularly helpful in attracting passers-by who may be too close to the building to see other signage. Blade signs are usually not electric, relying instead on daylight or spotlights directed at them. Monument signs are often large and impressive. They are placed at the entrances of malls or business plazas. You’ll also see them in front of office or apartment buildings. A monument sign can display the name of a single business, or identify all of the businesses in a plaza or shopping center. Designers often select natural elements such as brick, stone, and wood, so the monument sign doesn’t look out of place in the existing landscaping. They can also include an Electronic Message Center digital sign as part of their design. Many monument signs for shopping plazas are illuminated for better visibility at night. John Dobie, the founder of BSC Signs, started his sign career creating sandblasted wooden signs. Today these beautiful signs are offered by BSC Signs in both wood and stone. The preferred material for a wooden sandblasted sign is Western Red Cedar (or Redwood), chosen for its natural beauty and ability to withstand the elements. And what’s more environmentally attractive than using wood and stone? Sandblasted signs look great and lend a rustic, natural feeling to a business or organization. Need a brightly lit electric sign that can be seen from a distance? A Pole Sign will do the job. You will often see illuminated signs for national restaurant chains and hotels placed on tall poles near freeway interchanges. They are usually illuminated electric signs and can be very large. But poles are also used to elevate smaller electric signs only 20 or 30 feet, as is commonly seen with schools and churches. The sign can be mounted on a single pole, but two poles are sometimes used. Pylon Signs are a variation on the simpler pole sign, and the two terms are sometimes interchangeable. They’re also called freestanding signs. Instead of a single pole, the pylon sign may have two steel poles with signs spanning them. A pylon sign and a pole sign both serve the same purpose, making a sign visible by placing it high in the air. There’s a bit of crossover here, as some monument signs may look very similar to a pylon sign. Wall Signs are installed both inside and outside. They rely on ambient light for visibility, but often have lights carefully focused on them so they are more easily seen at night. Beautifully designed interior wall signs can be seen in the reception areas of many companies. They often require an elegant design that will perfectly suit the decor of the office and the style of the company. Interior wall signs for corporate and professional offices often use premium materials, such as waterjet cut polished stainless steel letters. Exterior wall signs can be as simple as a painted panel, but they come to life when designed with some 3D elements, such as extruded letters. A Vinyl Sign is typically a durable banner made for outside use. They have grommet holes that allow ropes to be attached. The sign’s message can include letters and graphic images, which are machine cut out of sheets of adhesive-backed vinyl, and then carefully applied to the surface of the flexible banner. Vinyl banners are available in a wide range of sizes and colors. They can be single or multi-color, and are surprisingly durable. A banner we designed for a Metro Denver high school is still in excellent condition after surviving many Colorado winters! Vinyl signs can also be made using sheets of corrugated plastic, which is sometimes called Coroplast®. OUR SIGN TOUR IS COMPLETE! We hope you enjoyed this visual introduction to the world of signs. And now that you know a little “Sign Language,” we think you’ll see that there’s a sign for every type of business. So the next time you’re driving around town, be sure to test your new sign knowledge and see if you can identify some of the signs you see. If you have any questions about what you’ve read in this article, or would like to get started on a sign project, please give us a call at 303-464-0644. We also invite you to take a look at our Gallery section to see many more photos.